When Adge Cutler was killed in a car accident so suddenly and so tragically, the reamining Wurzels did not think that they could carry on without him. Adge had created that 'Zummerset' sound which was their trademark - and who could replace Adge Cutler? At a meeting at John Miles' offices, the future of the band was very much in doubt. However, the band had a book full of gig dates which people kept asking if they were going to fulfill; so Pete Budd was offered the lead vocal role in the band; and they decided to carry on. According to the Wurzels World book, in the summer of 1974 The Wurzels make their debut post-Adge with several nights at The Globe Inn in Newton St Loe (on the A4 near Bath). The success of these gigs gives John Miles and the band members the confidence to carry on without Adge. Adge's death marked a curious turning point in the history of The Wurzels. 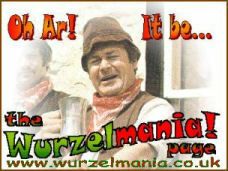 Deprived of the main song-writing talent, the remaining Wurzels recorded The Wurzels Are Scrumptious! in 1975, an album containing many favourites from the back catalogue, as well as a number of previously unrecorded Cutler-written songs put to music by Henry Davis. This attracted a lot of favourable attention. In 1976, the Wurzels released Combine Harvester, a re-work of the song Brand New Key by American singer/songwriter Melanie. This became a huge UK hit, topping the charts for two weeks and staying in the Top Fifty for thirteen weeks. An album Combine Harvester stayed in the Top Fifty Album Charts for eighteen weeks and their follow-up single I Am A Cider Drinker (a re-work of Una Paloma Blanca which had been a hit for Jonathan King the year before) reached #3. The band quickly followed that success with the release of another parody Farmer Bill's Cowman. The Wurzels worked constantly all over the country - they appeared in nearly every town in Great Britain, in venues ranging from cowsheds through top nightclubs to what they called 'posh' concert halls. They still performed much of Adge's material but started adding new songs of their own to their repertoire. The Wurzels also did a lot of radio and television work, appearing in Top of the Pops, Blue Peter, The Ken Dodd Show, Pebble Mill etc., and in 1977 they toured Canada, Australia and New Zealand.